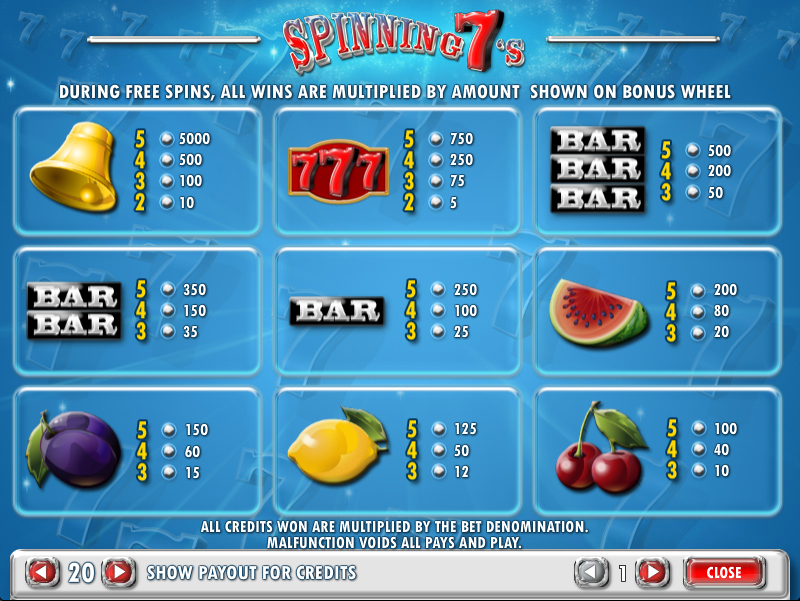 Spinning 7s is a game we’ve recently found over at Bet Victor and the online slots there tend to appear with very little fanfare. Some are better than others of course but this is certainly an intriguing one – it’s under the ownership of Amaya Gaming but recently developed by Cryptologic. Read on to find out how it all works. 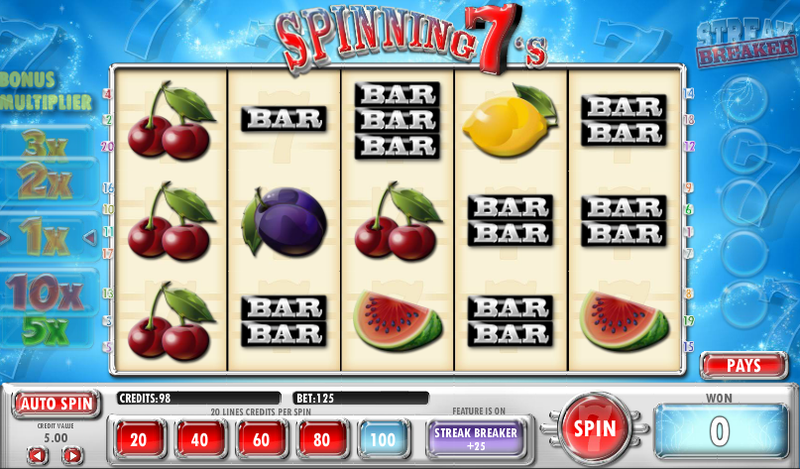 Spinning 7s is essentially a five reel and twenty payline slot with a traditional fruity theme. Those symbols are very nicely rendered though and include cherries, lemons, plums, watermelons, single, double and triple bars and finally the triple 7 icon. The gold bell is wild, there’s a blue and silver bonus symbol and then there’s the Spinning 7 which we shall explain below. These symbol can appear stacked on the reels and any time you land one it will spin and turn into another symbol (except the bell and bonus). All the 7s will transform into the same symbol and this can obviously pay out some big wins if they land in the right place. This is an added extra which we’ve seen in one or two other Cryptologic games; it’s pretty simple and you will receive a random payout if you are unlucky enough to have five non-winning spins in a row. It costs a little extra to play this feature and you turn it on/off by clicking the ‘Streak Breaker’ button underneath the reels. Each non-winning spin will be signified by a gold coin in the spaces to the right of the reels. Landing three, four or five of the sliver and blue bonus symbols anywhere on the reels will trigger fifteen, twenty or thirty spins respectively. During this round, a random multiplier will be awarded for each spin from the numbers on the left hand side of the reels. You can get some decent wins this way. We suggest you pay a little extra and use the Streak Breaker feature – it won’t change your long term winning prospects but it adds another level of interest to this game. Spinning 7s is quite good fun, especially with the addition of the Streak Breaker; it looks good and it even has some not-too-dreadful sound effects to accompany your gameplay.